What about the answer of these questions??? We appreciate your interest in using pakprep.com. We have more than 15,000+ fully explained MCQ’s and MOCK test for NUST and all other major universities. Please follow the bellow mentioned links for your preparation. For more details you can call us at 0335-5833265. We appreciate your interest in using pakprep.com. We have more than 15000+ fully explained MCQs in our practice test session which will help you in getting good marks in NUST test. Please follow the bellow mentioned links for your preparation. Where are the answers of the past papers?? We appreciate your interest in using pakprep.com. Please login to http://www.pakprep.com. You will get more than 15,000+ fully explained MCQ’s along with fully explained MOCK test of NUST NET. 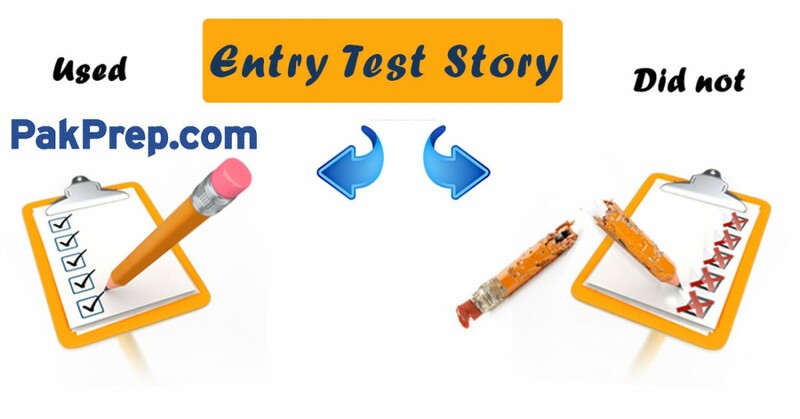 MOCK test are same like past papers which helps you in managing your time in you actual test, MOCK test will give you an environment of actual test and topic wise practice will help you in preparation of NET test, so that you can get maximum marks in NET. Please follow the bellow mentioned links for your preparation. For more details you can call us at 0335-5833265. We appreciate your interest in using pakprep.com. Papers are as per NUST pattern. Please follow the bellow mentioned link to know how http://www.pakprep.com helping students to get admission in their desired universities. We appreciate your interest in using pakprep.com. Please follow the bellow mentioned links for your preparation of NUST NET test. We have more than 15000+ fully explained MCQs and MOCK test for NUST. I have 88.11% in matric and 86.67% in FSc. What marks do i need to score in NET to secure an admission in SADA, Islamabad? (NUST) Their architecture school. We appreciate your interest in using pakprep.com. Your NET score should be around 130 in order to secure your admission. We have more than 15000+ fully explained MCQs for the preparation. Please follow the bellow mentioned links for your preparation. For more details you can call us at 0335-5833265. Are these arranged according to difficulty level?Beacause 4th aur 5th bht mushkil hain.. full version buy krne pe answers mil jayen gy inke?? We appreciate your interest in using pakprep.com. Yes all questions are arranged according to difficulty level and yes our all mcqs are explained. We have more than 15000+ fully explained MCQs for the preparation. Please follow the bellow mentioned links for your preparation. For more details you can call us at 0335-5833265. We appreciate your interest in using pakprep.com. NUST admission depends on your NET marks so you have to prepare for that as well. Your FSC marks should be around 80-85%, and your NET marks should be 145+. Please follow the bellow mentioned links for your preparation. I have 88% in Matric and 72% in Fsc, I gave NET 2 and got 134. How much do I need to get to secure admission in SEECS for BsCS? We appreciate your interest in using pakprep.com. For BSCS 134 marks are good but do try to get 140+ in order to make your admission more secure. Please follow the bellow mentioned links for your preparation. But we need NUST papers solution not yours..
Sir I have scored 78% in matric and 76% in Fsc-1 how much score should i needed in entry test to secure my admission in software engineering in nust Islamabad ? We appreciate your interest using pakprep.com. 130-135 marks are good for software engineering. Please follow the bellow mentioned link for your preparation. We appreciate your interest in using pakprep.com. 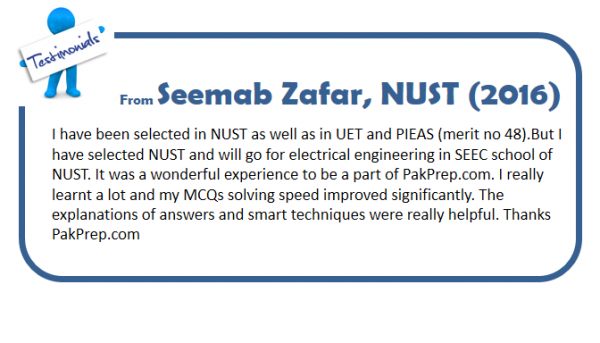 We have more than 15000+ fully explained MCQ’s and MOCK test for NUST which are same like NUST real test which will help you in getting good marks in NUST test.Please login to http://www.pakprep.com to get all relevant material. We appreciate your interest in using pakprep.com. There is no syllabus for NET you need to prepare complete course. However for NET 1 cover Part I course fully. Please follow the bellow mentioned link for your preparation. We appreciate your interest in using pakprep.com. You need to score 150+ Marks in NET in order to secure your admission. Please follow the bellow mentioned links for your preparation. We appreciate your interest in using pakprep.com. Login to http://www.pakprep.com you will get more than 15000+ mCQ’s with answers and also you will get MOCK test for NUST and all other major universities. Please follow the bellow mentioned links for your preparation. We appreciate your interest in using pakprep.com. Login to http://www.pakprep.com you will get more than 15000+ fully explained MCQ’s and MOCK test for NUST. Please follow the bellow mentioned links for your preparation. How much I need for civil engineering to secure admission in nust? We appreciate your interest in using pakprep.com. You need to score 135+ marks in order to secure your admission. Please follow the bellow mentioned links for your preparation. We appreciate your interest in using pakprep.com. login to http://www.pakprep.com and register yourself and that you can start your preparaation. Please follow the bellow mentioned links for your preparation. We appreciate your interest in using pakprep.com. To get admission in major engineering fields in NUST you need to score 145-150+ marks in order to secure your admission. Please follow the bellow mentioned link for your preparation. We appreciate your interest in using pakprep.com. NUST test will consist of 200 MCQ’s. You need to focus on NET test because NUST consider 75% test result in merit calculation. Please follow the bellow mentioned links for your preparation. We appreciate your interest in using pakprep.com. Please follow the bellow mentioned link to get 200 fee MCQ’s. Aoa sir how many net 1 marks i need to secure my admission in mechanical eng on paying cadets scheme. We appreciate your interest in using pakprep.com. 145-150 marks are good to secure admission in Mechanical Engineering. To get detailed information regarding payee cadet you need to contact GHQ directly. Please follow the bellow mentioned links for your preparation. i have no idea about net 1 test kindly suggest me….!!!!!! We appreciate your interest in using pakprep.com. If you have 60% marks in Fsc part I than you can apply for NUSt NET. For NET 1 you should prepare part I complete course and also some portion of part II. Your NET marks should be 145-150 in order to secure your admission in major engineering fields. Please follow the bellow mentioned link to stat your preparation. Sir these papers are past papers or sample papers? Are these MCQS important? We appreciate your interest in using pakprep.com. Yes these are important MCQ’s also visit http://www.pakprep.com to get more than 15000+ MCQ’s with answers and explanation. Please follow the bellow mentioned links for your preparation. We appreciate your interest in using pakprep.com. You need to improve your NET marks upto 130 in order to secure your admission. Please follow the bellow mentioned link to get 15000+ MCQ’s with answers and explanation your your preparation. I have scored 93% in Matric and 80% in first year. how much should I score in NET 1 to get admission in Aeronautical Engineering? this is my first time attending an Entry Test, so any quick suggestions will be valuable for me. Thanks. We appreciate your interest in using Pakprep.com. You have good acedamic record but you have to score 145 to 150 marks in NET 1 to secure your admission. We have all preparation material which helps you in the preparation which is consist of 15000+ fully explained MCQ’s. Please follow the below mentioned links to start preparation. We appreciate your interest in using pakprep.com. You need to score 130+ marks in order to secure your admission. Please follow the bellow mentioned link to get 15000+ MCQ’s with answers and explanation for your preparation. We appreciate your interest in using pakprep.com. NUST test will consist of 200 MCQ’s. You need to focus on NET test because NUST consider 75% test result in merit calculation. You should score 135+ marks NET 2 which will be held in march. Please follow the bellow mentioned links for your preparation. We appreciate your interest in using pakprep.com. For Mechanical your NET score should be around 140+. If you can improve it we will suggest you to go for 150+ to get scholarship. For your preparation please follow the bellow mentioned links. For more details you can call us at 0335-5833265. My Matric marks are 87.4% and in Fsc part 1 are 88%. How many score i have to achieve in nust for mechanical engg. We appreciate your interest in using pakprep.com. Your score should be between 145-150 however if you score 150+ marks in NUST test you can get scholarship as well. Please follow the bellow mentioned link for your preparation. For further details you can call our helpline at 0335-5833265. I got 95% marks in matric and 88% in fsc part 1.How many marks I have to achieve in NET 1 to get admission in Nust Civil or Software engineering? Sir can you kindly tell me how much do i need to score in NET to get admission in Electrical (Telecomunicaton) Engineering (MCS)? I have got 78.6 % marks in matric and 82.2% marks in fsc how much marks should I have in nust net??? Sir , I have downloaded the Nust paper 1 but I need the answers please give me the answers. I got 958 in matric and 417 in first year and 117 in net 1 can i get admission in nust bba ? Is there more than one test for one NET ?????? I have got 80% in Matric and 78% in firat year . How much score i need to get admission in NUST for engineering program .